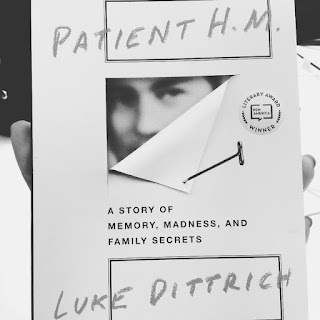 My friend gave me Patient H.M’s book for my 27th birthday dubbed “Patient H.M.: A Story of Memory, Madness, and Family Secrets” without knowing my extreme fascination with Patient H.M.’s (Henry Molaison) case and how his story fueled my passion in human memory and cognitive neuroscience. 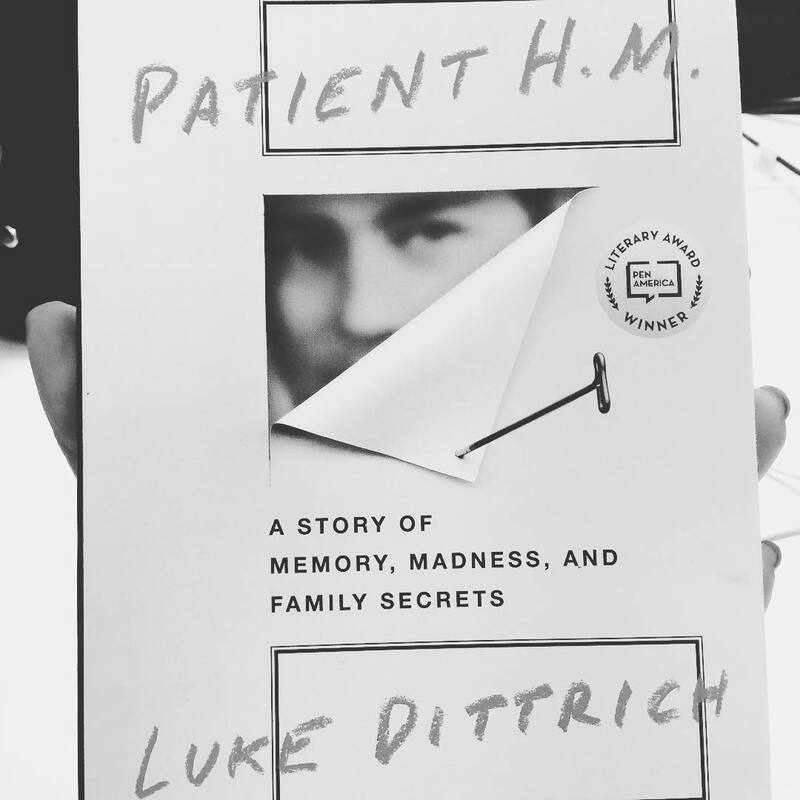 Patient H.M. is the most studied individual in the history of neuroscience. His case brought us the knowledge and complexity of what we know about human memory today. Patient H.M. was suffering from epileptic seizures that led surgeons to remove part of his medial temporal lobes (MTL) and a part of his hippocampus (responsible for memory formation) to relieve his severe epileptic seizures (Scoville, 1954, 1968; Scoville et al., 1953; Scoville & Milner, 1957). The surgery cured his epilepsy but he developed anterograde amnesia (inability to create new memories) while keeping his working memory and procedural memory intact. Scoville and Millner (1957) conducted a series of tasks to explore patient H.M.’s pre and post knowledge prior the onset of his Amnesia. Researchers discovered that H.M. was able to learn simple sensorimotor skills despite of his pervasive amnesia. 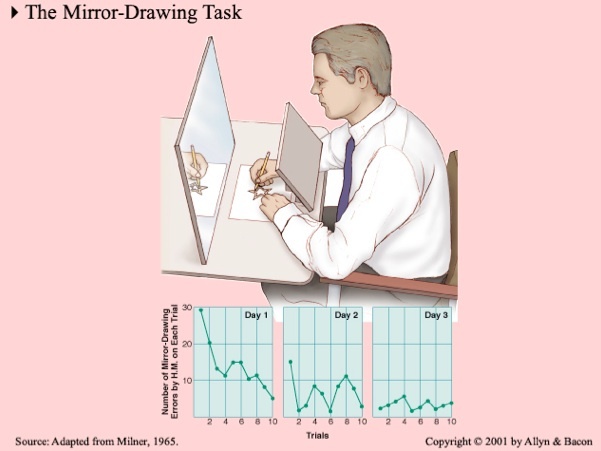 Dr. Brenda Milner tested H.M.’s motor skill via mirror drawing. In this task, HM was asked to look in a mirror where he sees both his hand holding a pencil and paper with two concentric outlines of a five-pointed star. The objective is for H.M. to draw a line between the outlines while only looking at the mirror. Since the star and the hand can only be seen in the mirror, the image is obviously reversed (to draw leftward requires moving right hand). In normal subjects, it requires several practices before they can master this task. We found that HM could learn and remember as quickly as normal subjects. However, the most interesting fact is that while HM improved his performance in every trial he does, he had no memory of having seen the star/having done this task before (remember he cannot form new memories due to anterograde amnesia). Scoville and Milner (1957) then concluded that H.M.’s semantic memory (e.g. general knowledge/daily life) was not impaired, but he was unable to develop new declarative (e.g. episodic/factual) memories. The researchers concluded that the anterior hippocampus and hippocampal gyrus (separate or together) are concerned in the retention of experience (Scoville and Milner, 1957). Patient H.M. left us a gift of a better understanding of the human memory. Because of his case, we learned that we have multiple memory systems (beyond long term/short term memory; declarative, procedural, semantic, and episodic memory) that are located in different parts of the brain which was a huge discovery in the field of neuroscience. The human brain is absolutely fascinating!